I know, I know. I’m always jabbering on about my new favorite kale salad and waxing poetic about kale salads in general. This salad, though! It’s crisp, sweet (but not too sweet) and features seasonal fennel and apple, which is a new-to-me pairing that you will definitely see again. I’ll admit that licorice-flavored fennel was a bit of an acquired taste for me, but now I can’t get enough of it. I’m not-so-secretly plotting to convert all visitors into kale salad enthusiasts, so I’m crossing my fingers you’ll give this salad a shot. It definitely went over well at girls’ night last week. I served it with a cheese plate, crackers, grapes and wine, of course. One final selling point before I go. Kale salads keep well in the refrigerator for a couple of days, which means this salad is a great candidate for your lunchbox! Microplane zester, for removing zest from lemon. 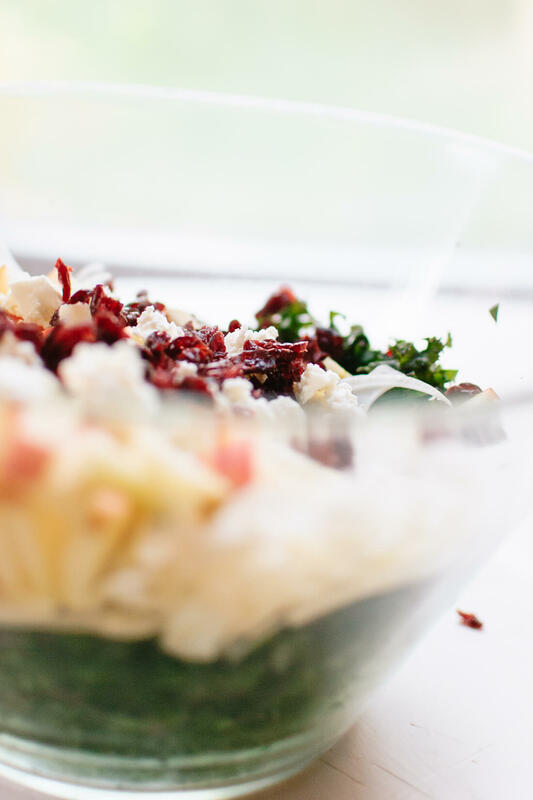 Healthy kale salad featuring shaved fennel, chopped honeycrisp apple, toasted pepitas, dried cranberries and goat cheese, tossed in a lemony dressing. This recipe yields 2 large, full-meal salads or 4 side salads. To prepare the kale: Use a chef’s knife to remove the tough ribs from the kale, then discard the ribs. Chop the kale leaves into small, bite-sized pieces. 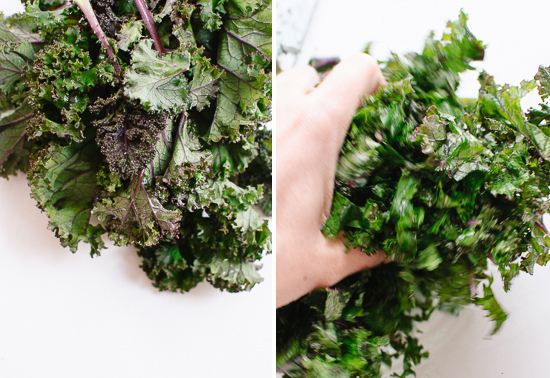 Transfer the chopped kale to a big salad bowl. Sprinkle a small pinch of sea salt over the kale and massage the leaves with your hands by lightly scrunching big handfuls at a time, until the leaves are darker in color and fragrant. To prepare the remaining salad ingredients: Chop the apple into small, bite-sized pieces. Use a chef’s knife or mandoline to slice the fennel as thin as possible. Transfer the prepared apple and fennel to the salad bowl. Use a fork to crumble the goat cheese over the salad. Roughly chop the cranberries and add them to the bowl. To toast the pepitas: In a skillet over medium-low heat, toast the nuts, tossing frequently, until fragrant and starting to make little popping noises, about 3 to 6 minutes. Transfer the pepitas to a bowl to cool. To make the dressing: In a small bowl, whisk together all of the dressing ingredients until emulsified. To prepare the salad: Add the cooled pepitas to the salad bowl. Drizzle dressing over the salad, just enough to lightly coat the kale once tossed (you might have some leftover dressing). Toss the salad well. For best flavor, let the salad rest for 10 minutes before serving. Make it dairy free/vegan: Skip the goat cheese. Diced avocado is nice with this salad if you want to make up for lost creaminess. Storage suggestions: This salad keeps well in the fridge, covered, for a couple of days. It’s a great pack-for-lunch option. 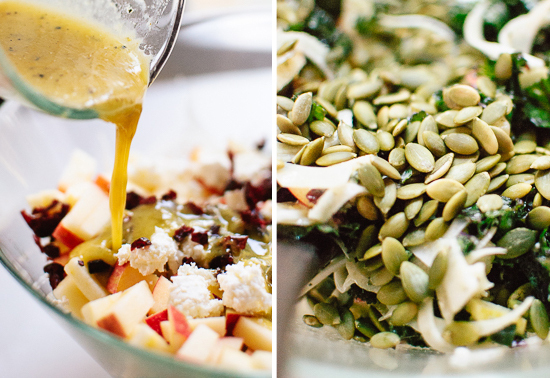 Change it up: Trade other fall/winter produce for the fennel and apple. I think cubed and roasted butternut squash would be delicious. Hi Leah, yes, it sure does! I made this for a potluck at work today and everyone loved it and asked for the recipe. I had to substitute a few ingredients and used what I had. I used blueberries instead of cranberries. Substituted the pepitas for sliced almonds and shredded parmesan for goat cheese. Still came out delicious. Thank you! What a lovely combination! I’ve never tried fennel (anything licorice-like scares me away) but I’d totally be willing to give it a try in this salad. Kale is one of my absolute favorites. 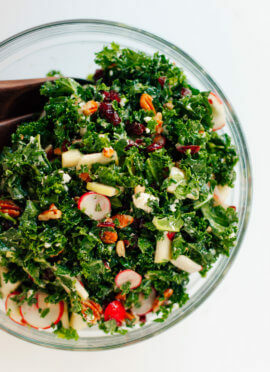 Who doesn’t love a good kale salad? Thanks, Erica! I have never been big on licorice, but I love finely sliced, raw fennel. Thank you, Cris! Hope you enjoy the salad. It might just change your mind about fennel. :) Thank you for your kind words about my work! Still learning to love fennel…I do like it roasted on burgers though! I love fennel and have for years. In the winter I sometimes eat a whole fennel (minus the tops) between lunch & supper. (In summer I eat plums, nectarines, apricots & all kinds of berries but they are no longer available, especially organic which is what I normally buy so I start with Apples; Pears spoil too quickly so I only buy what I can eat that day.I wait a while before I buy citrus (except for lemons and limes),). I haven’t seen organic fennel except once on Fresh Direct. I tried out Fresh Direct when they offered me two months no delivery charge. Now I know what to do if I can’t get to the store. They carry organic but not the selection I get at Wild By Nature (a King Kullen division)which is 5 minutes from my house. BTW, your recipes, photos & chatter plus America’s Test Kitchen have reawakened my interest in cooking which after cooking for almost 64 years 7/24 was pretty much gone. Who’ve thought? I bought a new chef’s knife, a NuWave oven and cook top, a tiny blender (I cook for 1 after years of cooking for 7) and all kinds of gadgets most of which are great, and some go back! Years back I regularly baked bread using 4 or 5 different recipes, splitting each loaf in half and freezing them. When I had company I would defrost several half loaves and offer a selection of homemade breads! But then my Mother, my best bread eater who lived with me her last 16 years, passed away and then I was told I was gluten intolerant so no more bread making. Before that I even taught bread-making in my own kitchen with no more than 6 students. Everyone went home with a loaf. I am about to try your recipe, but until I do I am not going to rate your recipe! Thank you, Ellen! I’m impressed that you can polish off a whole fennel between lunch and supper. I love eating sliced, raw fennel with a dash of salt! I’m so glad you’re back in the kitchen again. Hope you love this salad! It looks fantastic! I’m a little reticent to eat raw fennel (love it cooked) because of the anise flavor, but I’m willing to try. Thanks, Kate! That’s interesting! I’ve always thought the anise flavor is more pronounced in cooked form. love kale salad. I haven’t tried fennel raw before but I am willing to try anything once!! 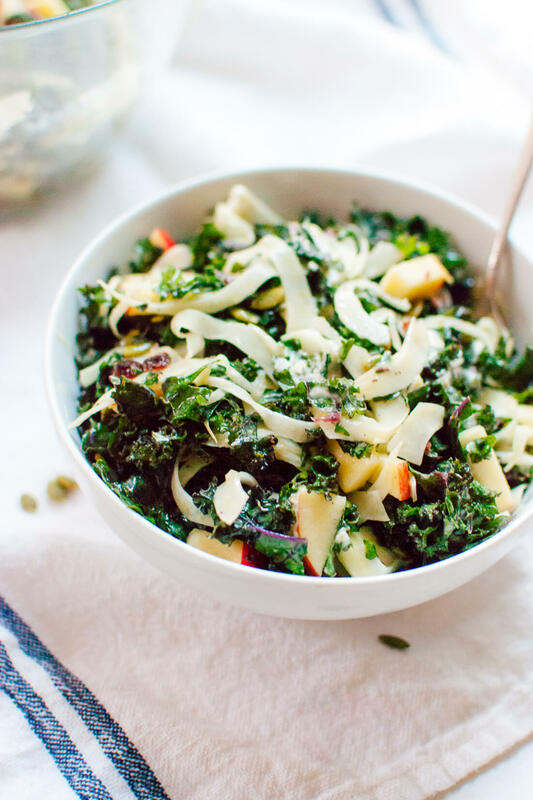 I love that you can dress a kale salad in the morning and it won’t be soggy at lunch! Perfect if you ask me! I really love raw fennel! Hope you give it a try soon! Yep. This salad is FAB. This is the fall I try fennel for the 1st time (I KNOW)! This salad looks super yummy… How much would you say it makes (2 people, 3 people)? Thanks for the recipe! Hey Ella! I’m sorry, that was totally an oversight on my part. The salad yields enough for two large, dinner-sized portions or four side salads. No problem! :) I might try to make this as a Thanksgiving side dish… yum! BTW as I type this, potatoes and carrots are roasting in my oven for your carrot/lentil/miso/parsley/red potato recipe because 1) today is my mom’s birthday 2) She is OBSESSED with anything involving potatoes and 3) never have I ever made one of your recipes that I was 100% in love with. Hooray! Awesome! I hope you all enjoyed that dish. Happy belated birthday to your mom! I’m making this for the kiddos lunch tomorrow…still need to invest in a madoline. Happy Nesting! Hope you all enjoy it! Sounds like your kids have quite a palate. I never would have touched kale, fennel or goat cheese before age 20! I absolutely love fennel and apple together. 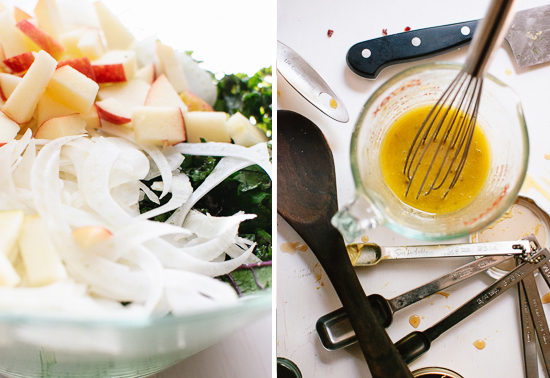 I make a raw fennel and apple shaved salad that is so crisp. 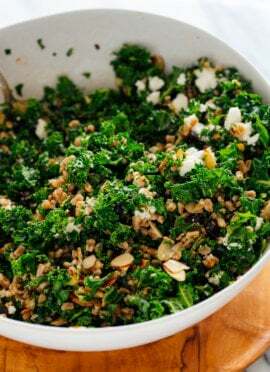 Can’t wait to try your version with kale and of course, goat cheese! YUM! So many wonderful things in this salad! I can’t wait to make this. I’ve had fennel in salads in restaurants, but I’ve never tried it myself. Of course I’m nuts over Honeycrisp, but I think the addition of goat cheese makes this salad even more mouthwatering! Made this beautiful creation tonight–thank you!! I loved the combo of flavors and textures. The fennel was much softer in flavor than I remembered, and I’m thrilled to find a delicious way to eat it raw. I really appreciate that our palates are similar, so I can always count on the fact that I will LOVE your recipes. You make my meal planning so much simpler. Wow, you are quick, Wendy! I’m so glad you enjoyed the salad. Sounds like we are palate twins (is that weird?). Honeycrisps are the bessssssst!! Love this salad girl! What a beautiful salad! 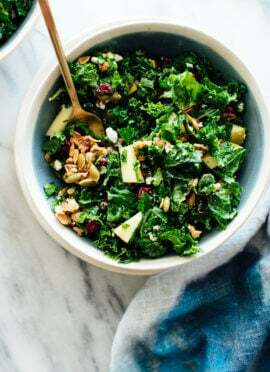 I often try to convert my guests to kale-lovers too ;) I think this would be lovely at Thanksgiving to lighten things up! Oh good call, this would be a great Thanksgiving option! This salad looks delicious! I love that is keeps in the fridge, that’s really handy. I love that you used fennel – it’s one of my favourite ingredients and it’s so under-utilised! I’m definitely going to try with avocado – I already can’t wait for lunch tomorrow! Thanks, Alessandra! Hope you love it! Once again I have everything this recipe needs, already stocked in my pantry. I’ve always got pepitas on hand, and this week the local orchard was selling huge boxes of apple “seconds” for $7 a box, fennel and lovely dark kale was on sale at Kroger, and as I wandered Aldi’s I spied logs of goat cheese from across the produce bins. Somebody had given me a 2 pound bag of dried cranberries and I wondered what to do with them. Now I know! Hail to the mighty kale! Personally, I’m a total fan of fennel, especially in salads. Digging this! Guuuurrrlll, you know I’m a MAJOR kale enthusiast, so you don’t have to tell me twice! This is a looker, it is. I might be in love. Love this!!! Perfect lunch idea! Looks great! How many people does it serve? Nevermind! Just saw the other comments! A lovely salad to eat on the spot (for the vitamins). To carry in my lunchbox, I prepared the dressing the night before and cut the apple, kale and fennel just before leaving for work. I also love using the green part of the fennel. Thanks, Teti! I’m glad you enjoyed the salad! Love the textures, perfect autumn salad! 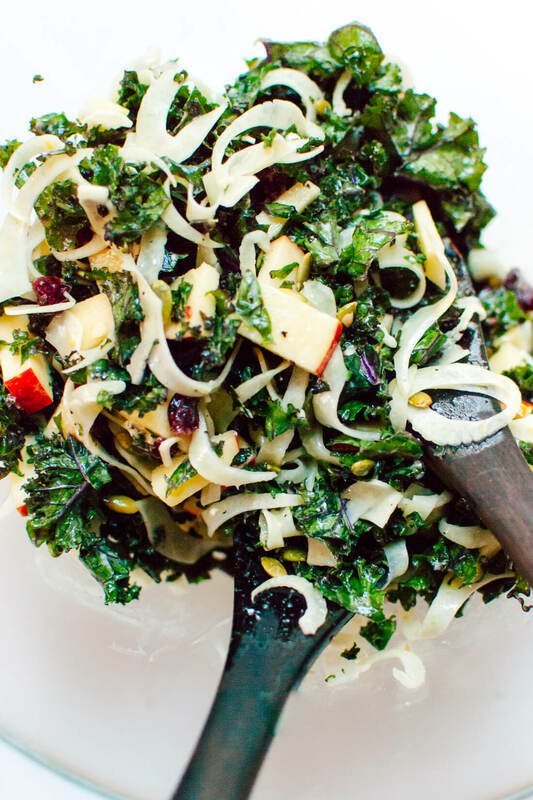 the kale … yum … i really need to start making salads with kale at home – so delicious. Thanks, Dervla! And yes, I think it’s time! Love me some homemade kale salads. This salad is delicious! Loved the subtle lemon overtones in the dressing. The fennel was a surprising, but delicious, addition. Thank you for this recipe! Hooray! Thank you, Erin! Glad you enjoyed it. 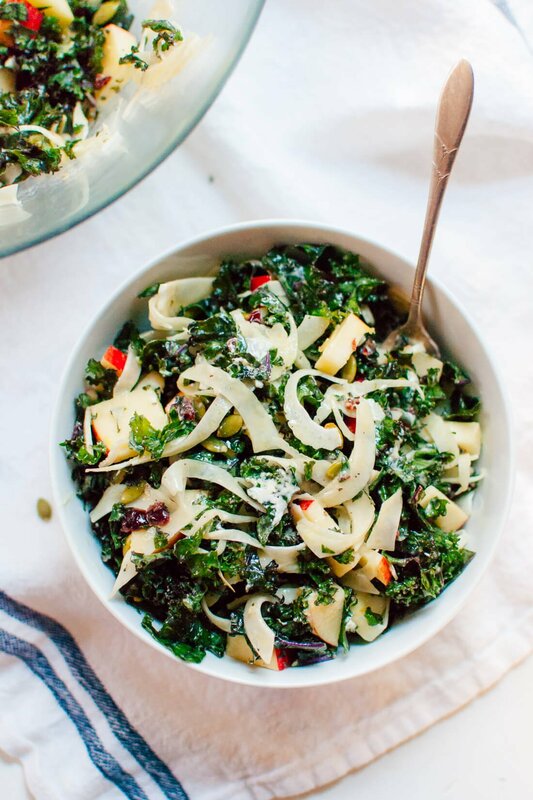 Just the recipe needed to switch up my kale salad routine! Ah-mazing!! I loved your idea of roasted buatternut squash and added it in with the apples and it was delightful. As alwars, you knocked this salad out of the park, thanks Kate! p.s. I am baking a batch of your Maple Pumpkin muffins as I type, haven’t tasted yet but they smell devine… Two C&K recipes in one night! Love it! Thank you, Kate! I can’t believe I JUST found your blog. I’m absolutely loving your quick salad recipes and can’t wait to try some of them out. Everything looks amazing! I made this salad last night for dinner and had the leftovers this afternoon for lunch and both were absolutely delicious! Love this salad, plan to make it many more times and it’s a great salad to make over the holidays! Thanks, Jena! Glad you’re loving the salad! Have you seen the apple cheat sheet at Splendid Table? 7,000 varieties. Who knew. Wow, no, I haven’t! That’s a lot of apples! I’m with you on your love for kale salads! Still trying to convince the husband :) Fennel sounds perfect in this salad. Can’t wait to try. We were a bit skeptical about the fennel, and I admit I only added a bit at first… then I had a test bite…. WOW! I ended up adding the rest of the sliced bulb! This salad is our new favorite and we’re making it again tonight. Thank you so much for your creative ideas! Hooray! Thank you, Rhonda. Glad you appreciated the raw fennel. I too am a lover of kale salads and especially like that leftovers last so well in the fridge. I’ve never made a version with fennel before but now it’s all I can think about. The rest of the ingredients are favorites of mine so I know this will be delicious, can’t wait to give this one a try. BTW, your photos are gorgeous! Thanks, Jen! Hope you get a chance to try this salad soon. Fennel and kale and goat cheese is super tasty! Just wanted you to know we make this salad like weekly. New favorite salad- my husband claims it’s the best he as ever eaten! Even the toddler tried it! Thank you! Yes! I’m amazed that your toddler tried fennel—I didn’t eat fennel until I was probably 25 years old! This recipe is excellent! I made the salad for a dinner party, and it was a big hit. I substituted pomegranate seeds for the cranberries since they’re in season. Amazing salad with a phenomenal dressing! You’re right – it did keep very well in the fridge. I ate half one day and half the next. We really enjoyed this salad tonight. I didn’t have any cranberries so I chopped up a few dried figs. Delicious! Great recipe. Thank you, Deb! Happy to hear it. I am growing kale for the first time and trying all the recipes I can find. This one is a keeper! Since it is summer I substituted a gala Apple and can’t wait for fall to try the honey crisp. Thank you so much for this recipe. Thank you, Ginny! Glad you found my salad! made it with Butternut Squash roasted and cubed per Bittman and it was amazing! Likely going to reprise it with avocado for a vegan Thanksgiving dinner salad. Thank you! Love your Thanksgiving idea. Love this recipe. I omitted the cranberries because I usually find them too sweet, and the goat cheese because I was serving it with something cheezy- but I’m sure it’d be fantastic with it in there. Massaging the kale is where it’s at. I will feel more confident making kale salad in the future. This salad was DELICIOUS!!! My boyfriend sometimes makes faces at my kale salads and he loved it! And your tips to prepare the kale helped a TON!!! This salad was delicious! My whole family, including the kids, ate it all up. You just feel good serving it to them. So good for us! Thank you! Awesome!!! Thanks for letting me know, Paige! Not sure why I waited so long to try this one – just exceptional. Made it for a supper club last night and it was such a hit. The fennel is such a perfect touch – cannot wait to use it more often. Luckily, I have enough ingredients to continue whipping this up throughout the week. Can kale salads please be your biggest chapter in the upcoming book? My absolute favourite! Your kale salads are absolutely delicious. I’ve made 2 so far and love them both, can’t wait to make them all. Beautiful, fast, easy recipe! I’m writing a post about cooking with whole foods on my own blog, and I’d like to share this with full credit. Please let me know if that’s alright with you! Thanks! Hi Erika, thanks for asking! I’m sorry, I don’t allow other websites to publish my full recipes. If you’d like to share one of my photos and link over to my post for the recipe, that would be fine! Well, I’ll take it! Thanks, Sarah. Glad you enjoyed this one. Believe or not I’ve been avoiding Kale for the last 5 years thinking it was a ‘fad’ but this recipe changed my mind. I love fennel & cranberries so decided to try it. Yum does not describe how good it is. Thanks Kate (& Cookie) – another great recipe. I tried this salad when I visited my son (and family) in San Diego. It was amazing. So, now here in Ohio I have grown Kale in my raised beds so I can make it myself. Today. Hi Nancy! I’m so glad you enjoyed this salad with your family. I bet it will be extra tasty with your home-grown kale. Thanks for saying hi! This has to be the best salad I’ve ever had. I used slivered almonds instead of pepitas (laziness – I had almonds in the cupboard, but not pepitas). There were some leftovers, so the next day I added a chopped avocado to bulk them up. Simply divine. I think some roasted and cooled asparagus would be good, too. A definite keeper. Thank you so much, Liz! Happy to hear it! Made this salad tonight and absolutely loved it! So many interesting flavors and it couldn’t have been easier to prepare. Thanks! This was deeeelish! I made it and added a little cold quinoa for a bit more protein as this was my post-run meal. Just fabulously filling and palate-pleasing! Thank you! Thank you, Nicole! I’m so glad you enjoyed it. Bet it was tasty with quinoa. I made this and it is a great salad! I had never had fennel before today and it tastes great! I ate it as a solo large salad for lunch. Very satisfied. If eating as a dinner salad or small lunch salad, I would pair with great toasted garlic bread or bruschetta. Or chicken on this (if you eat meat) would be great too. I also wanted to add the idea to list your comments from most recent to least recent. It is nice to see suggestions of people who just made the salad last week, rather than 2 years ago. Or even including an upvote downvoting system for us home chef’s to see the top comments with extra suggestions of toppings, adding quinoa or other bases, etc. Love the layout of your site though, and photos, and the name… Your site is a winner amongst many plant based recipe blogs. Thank you for your hard work I make one of your recipes at least once a week! Hi Joanna, I’m so glad you enjoyed your first fennel experience! Thanks for the note. That is a good suggestion for the commenting order. I will look into it! I don’t want to sound dramatic, but this salad could possibly be life changing. No, ya know what, I’m going to say it….. this is the best salad I have ever had in my entire life, and I have had A LOT of salad. Thank you so much! Victory!! Thanks, Lindsay! Your comment made me smile. Made this for a dinner party. This salad is SOOOOOO good! I made it as a test run the Saturday before Thanksgiving and my father-in-law ended up having seconds and said he doesn’t even think he has had kale before! ha! I made it again on Sunday and plan on doubling the recipe for Thanksgiving. So tasty! Hi, Bridget – I’m happy those picky eaters enjoyed it! So happy it pleased a bunch of meat eaters! Thanks for reading, Stephanie. This stuff makes me smile. This salad is fantastic and my new favorite. I usually add more syrup and less mustard to the dressing because I like it sweeter and it’s perfect. Thanks again for another wonderful, healthy recipe! Best thing about making your own dressing, is adjusting it to your taste. Thanks for your comment and review, Emily! Thank you for knocking this out of the ballpark. I love hearing it. So, thank you Erin! I do think the goat cheese adds a lot too! Thank you, Samantha for sharing. I appreciate the review. This salad is wonderful and such a good keeper. I’m not a big fennel fan, but the shaved fennel has a mild fennel flavour that is perfect in this salad. I served it to friends who also choose not to eat fennel and they were pleasantly surprised to discover how good this salad is with the fennel in it. I like to add some of the lemon juice and olive oil to the kale when massaging it. Also, the salad is nice served on individual plates with the goat cheese sprinkled over the top. I’m glad you tried it anyway, Catherine! Thanks for the review. THIS SALAD OS EVERYTHING. My picky father and sister ate this salad like it was the best thing ever. I eat this weekly now. I always sub the goat cheese for feta, however, and it is amazing!!! This recipe has also revealed the beauty of the honeycrisp appleton me. Perfectly sweet and juicy! Wonderful, Diari! Thanks so much for the review. Made this salad for a dinner with my parents. It was a big hit. Wonderful, Janice! Thanks for your review. I made this salad exactly as written. Absolutely delicious. Ate it three days in a row. I’m really happy to hear that, Jacklyn. Thanks for commenting! Great to hear, Elieen! Thanks so much for your review.